The Midwestern prairie is a tallgrass-dominated prairie. Prior to agricultural production, tallgrass prairies were dominated by grasses such as switchgrass, prairie cordgrass, big bluestem, and Indiangrass. These four grasses can be as tall as 8 feet or more and produce a great amount of cellulosic feedstock with minimum input. 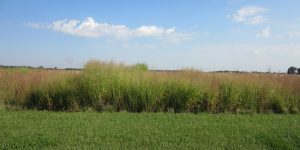 They are warm-season (C4) perennial grasses, and can be grown for forage or biofuel feedstock production on marginal and/or less productive agricultural land. When grown on marginal land, the unique characteristics of each species confer abilities to improve C sequestration, wildlife habitat, and soil and water conservation.